Fruit Jellies for sale. Buy online at Zingerman's Mail Order. Gourmet Gifts. Food Gifts. Every chocolate connoisseur needs a break. Something refreshing to lighten the mood in between the serious single varietal bars and the fancy truffles. 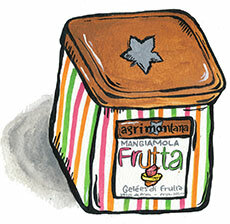 These Italian fruit jellies are a massage for your weary taste buds. They come in six flavors: amarena (sour cherry), limone (lemon), cedro (citron), lampone (raspberry), fragola (strawberry) and arancia (orange). The berry flavors taste like ripe fruits that have just been put in the jam jar. The citrus flavors remind me of warm, sugared candied peels. And the sour cherry is my favorite. Texturally, the candies are a cross between a pâte de fruit and a gumdrop, giving you something to chew on.